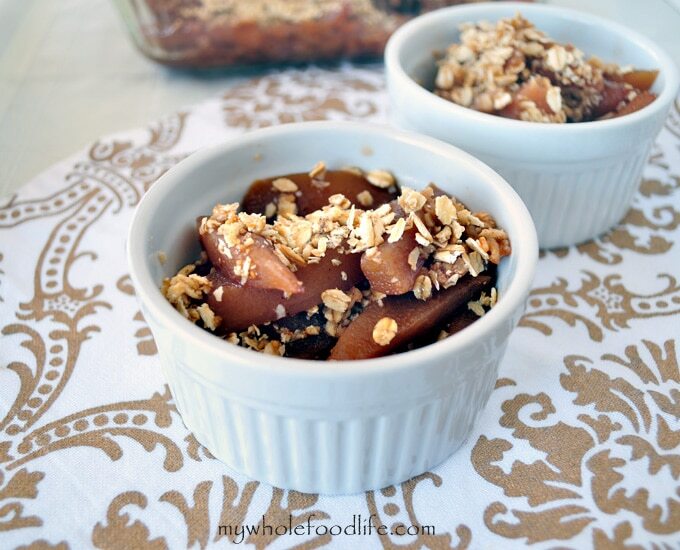 This slow roasted pear crumble is simply amazing. I did not set out to make a pear crumble recipe at first. I am not even a huge fan of pears, but my husband and my daughter Meadow love them. I do love a good fruit crumble recipe though. Since we ended up getting a bag of pears in our co op basket this past weekend, I decided to slow cook them in the crock pot to see how they would turn out. The smell in the house that day was amazing. A Yankee Candle had nothing on these babies. The pears came out so delicious in fact that even I had some. I decided to boost them into even more awesomeness with the addition of a crumb topping. It worked. Marcus said they were the best part of his lunch this week. This dish would be a perfect addition to your Thanksgiving meal. I’m making it this holiday season for sure. Throw all the ingredients in the crock pot and cook on high for the first hour and then turn to back to low for at least 3-4 hours. This only gets better the longer you cook it. For the next step, you can place the pears in an 8X8 glass baking dish . Take some of the liquid from the crock pot and add it to the pears. In a food processor , combine all the ingredients and pulse until the oats are sticking together. Sprinkle the mixture on top of the pears. Can you use butter? Or applesauce might work too. I had some extra pears so I searched your blog and found this recipe. Wow wow wow!!!! It is amazingly delicious. I have made a few crumbles before but never been happy with the outcome, it has always been too buttery. But this recipe has no butter so it's not an issue. I had 3 pears so I halved the pear slow cooker ingredients in your recipe; and I wanted lots of crumble so I made 1-1/2 times the crumble ingredients in your recipe; and I baked it in a 5x9 loaf pan. PERFECTION! I think this would be great with many other types of fruit also. Thanks! I love your website! One question, do you peel the pears or leave them on? Thanks Candee! You can do either. I think I peeled mine. I love your website! One question, do you peel the pears or leave the peels on? I may just need to go to bed, but firm pears...does that mean ripened, or not? Thanks for all your yummy recipes! They are ripened, but not super soft.